OHS’s Day of Giving raises more than $300,000 to help pets in need. It was a day of compassion, kindness and inspiration. The Day of Giving took place on Oct. 4 and celebrated donors who have been a vital part of the Oregon Humane Society’s 150 year legacy. 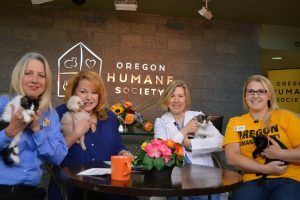 Throughout the day, KATU-TV aired stories about OHS programs — highlighting adoption stories, new medical treatments, behavior breakthroughs, disaster response and humane education. Members of the community called, clicked and donated more than $300,000 to help OHS continue to saving lives and create a more humane society. The stories of two very special guests were highlighted during the Day of Giving were Johnny Perez and Charles. Each received critical medical treatment at the OHS Animal Medical Learning Center. Johnny Perez was wandering the streets as a stray and hit by a car — suffering a devastating injury. He was transferred to the Oregon Humane Society where the medical team repaired his complex fracture and helped him heal. See how Facebook helped him find his forever home. Watch the video about Johnny Perez. Johnny was wandering as a stray in Portland area when he was hit by a car and suffered a devastating injury. The Oregon Humane Society’s medical team was able to repair his complex fracture. After months of treatment, Johnny found the perfect home with another OHS dog. “I’m so grateful to everyone who helped.” Says Johnny’s adopter, Melissa.Your donations make these happy tails possible. Donate now. Charles’ diabetes had been severely neglected when he was found and brought to OHS. The medical team nursed him back to health and stabilized his chronic condition. See why Charles shares a special bond with this adopter.